When I was in High School my best friend would always rave about Death by Chocolate. It sounded amazing but I never tried it until her graduation dinner. Oh. My. Gosh. I was hooked. I've been making it ever since. It's one of my very favorite desserts to whip up because it's so easy! Perfect for a picnic or BBQ- or just to impress friend and family. Prepare Brownies according to package directions. When finished let cool completely. Break brownies into bite sized chunks. Prepare pudding according to directions. Chop Snicker bars into small pieces. Layer 1/3 of brownies in the bottom of a large bowl. 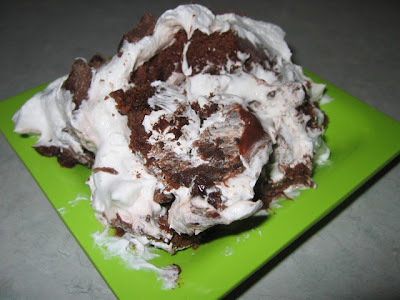 Cover brownies with a layer of pudding. 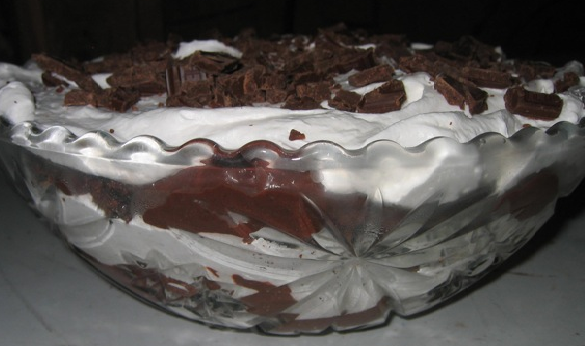 Spread a layer of cool whip over pudding. Sprinkle with Snickers'. Repeat. (Brownies, Pudding, Cool Whip and Snickers). Refrigerate for 30 minutes before serving. Pretty sure I would love this chocolate mess! MMM- I havent had this forever!